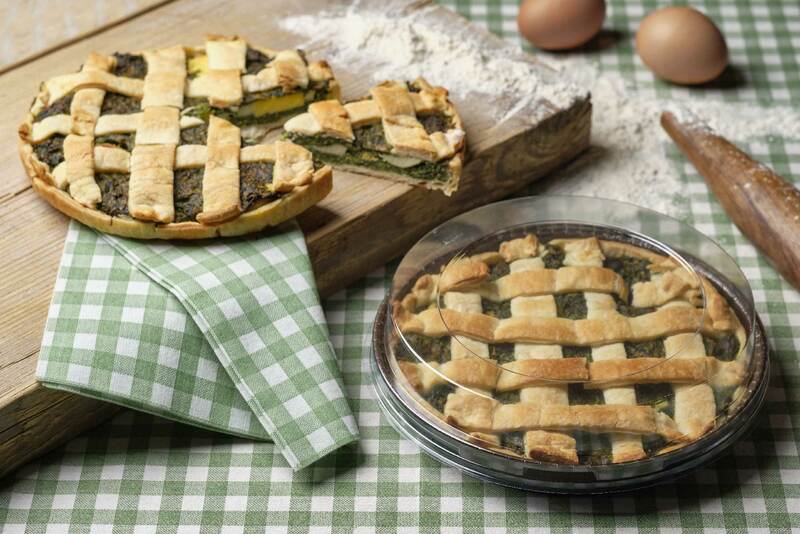 This delicious quiche is an Italian traditional dish served on Easter day or on Easter Monday. It’s usually made with artichokes or chard, but this version with spinach is as tasty as the traditional ones. First of all, prepare the spinach: wash it thoroughly, then blanch it in a pot with a pinch of salt, for about 10 minutes. Chop up the spinach, then put it in a pan with a little bit of oil, until it's lightly cooked. Once it has cooled down, put it in a bowl with the ricotta cheese, the parmesan, the pecorino cheese and add salt and pepper to give taste. Add the egg and blend. Prepare the base of the baking mold using one roll of puff pastry. Fill the baking mold with the spinach-based filling. Create small hollows in the filling, and put a whole egg in each one. This way, they’ll cook during the baking in the oven. Use the remaining dough to create some strips and lay them on top of the quiche. Bake the quiche in a pre-heated oven at 180°C or 356°F for about 1 hour. The Optima baking mold OP 205-25 CBBT is made of pure cellulose cardboard, with a rolled edge. It’s food fat resistant and can withstand baking up to 220°C. Its elegant design in terracotta color makes it suitable for the presentation of the finished product. This product is complementary with COPERCHIO 205 Pet plastic lid, ideal for Optima baking molds and suitable for contact with food and packaging.